Five Day Training on Legislative Research for Assistant Research Officers (AROs) Underway. 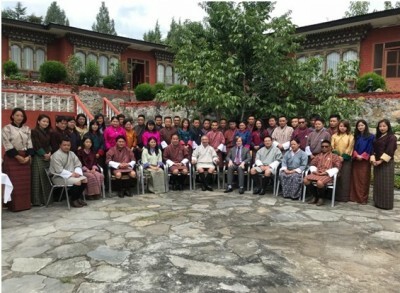 A Five day training course on Legislative Research is underway at Metta Resort, Paro. The training is being attended by 33 Asst. Research Officers (AROs) of National Assembly. The training organized by the National Assembly Secretariat is facilitated by Mr. Carl Baker from the Westminster Foundation for Democracy (WFD) with a local consultant. The training is conducted through a project funded by International Institute for Democracy and Electorial Assistance (IIDEA). The training is expected to enhance the capacity of AROs to conduct effective research and provide reliable information to Hon’ble Members of Parliament. The Parliament of Bhutan would like to thank International IDEA for their support and also to the WFD for providing the resource person on pro bono basis. The training will conclude on 24th of August 2018.